Jeffrey Welch's Blog: Why Do Dogs Pant? Why do dogs pant? My dog, Baby, and I go hiking through a nearby forest just about every day. By the time we return home, we’re both huffing and puffing a bit harder than normal. The hotter and more humid the weather is, the more I sweat, and the more intensely my dog pants. While I’m always sweating like a maniac, though, Baby remains as dry as the proverbial bone. Does her tongue, lolling off to one side, help her stay cool? 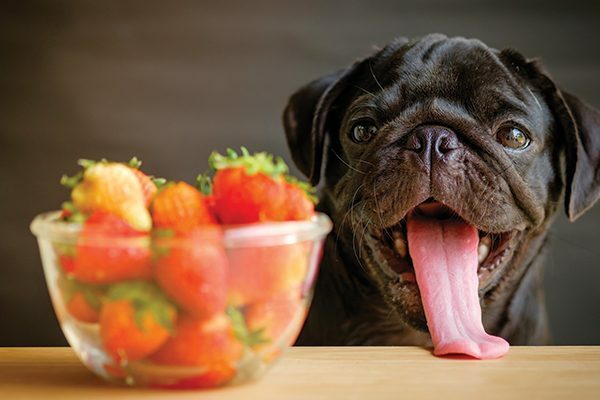 A dog with his tongue out next to a bowl of strawberries. Photography by duxx/shutterstock. One of the most obvious differences between humans and dogs is how our bodies respond when they start to warm up. Dogs can manage rising body temperature through sweat and through their blood, like us, but not effectively. For dogs, panting is the primary mode of heat relief. Do dogs sweat at all? Yes! Dogs have glands all over their bodies, just like we do, but theirs serve different functions. Most of the pores and hair follicles on our bodies can produce sweat. For the most part, a dog’s glands release oils and scent chemicals called pheromones. Between baths, the oils protect and condition the skin and coat, while the pheromones are largely used to communicate with other dogs. A dog’s true sweat glands are located on their noses and feet. No one’s really sure what a dog’s sweat glands are actually for. Moisture on the nose might help them detect scents with more precision. When dogs sweat through the paw pads on their feet, it could be for added traction. Whether we’re talking about a Maltese or a Mastiff, a dog has so few proper sweat glands, they’re practically useless for cooling a dog’s entire body. In the summertime or after a period of heavy activity, you may notice that what little exposed skin your dog has changes color slightly. Pigmentation and markings vary from dog to dog, but when a dog gets hot enough, his normal skin color takes on a pinkish hue. As a dog’s body heats up, the blood vessels closest to the skin widen or dilate. Warm blood passes through these expanded vessels, cooling down on its way back to the heart. Since dogs show very little skin and can’t sweat anywhere near as much as we do, temperature control is left to their mouths! How does dog panting work? Have you ever posted a photo of your dog’s mouth hanging open for “Tongue-Out Tuesday”? These images are endearing, even comical. When it’s hot or humid, and your dog’s tongue is at full extension, it means he’s doing all he can to cool off! The methods dogs and people use differ, but the effects are the same. When we sweat, the hottest fluid in our body rises to the surface and evaporates. That evaporation cools us gradually. Panting does the same for dogs. The warmest part of a dog’s body is the chest cavity, where his heart and lungs are in constant motion. The more real estate a dog can expose to the open air, the faster super-heated fluids can evaporate. A wide-open mouth also gives moisture a chance to evaporate from every surface the open air can reach, including a dog’s windpipe and lungs. In theory, the more intensely a dog pants, the more relief it provides. If the heat is extreme, or if your dog has a short muzzle, even panting at full strength can’t keep him from overheating. Limiting exercise to short bursts in the morning or evening, making sure your dog has fresh water and letting him lounge around with the air conditioning on are always winning strategies! Thumbnail: Photography ©eurobanks | Thinkstock. The post Why Do Dogs Pant? appeared first on Dogster.